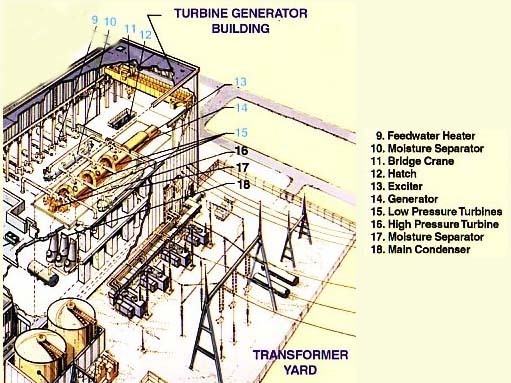 The Turbine Building (graphic) is an enclosed metal and girder structure that houses: (1) Turbine, generator and the support lubrication and cooling systems, (2) Condensate-feedwater systems supply water to the steam generators (3) Circulating water to and from condenser, (4) Electrical switchgear rooms that supply electrical power to plant components, (5) Demineralized water system that supplies clean water for cooling plant components, and (6) Control Room. Outside the building are the transformers that either supply power to the plant for startup or that supply power to the grid for distribution to your home. Transformer increases voltage from ~ 20KV to 345 KV Steam supplied to turbine turns shaft of generator which produces electrical power. Condenser where river water flows through small tubes. Steam flows on outside of tubes and is cooled to water. 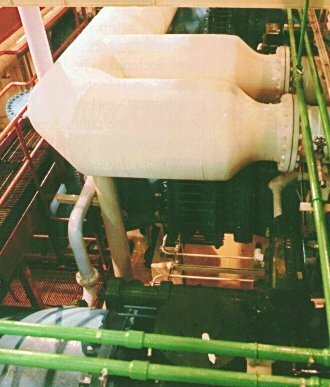 Circulating water from river cools condenser Feedwater pump supplies water to steam generators. Control Room where licensed operators control the plant equipment. Piping in condensate system.